Historical Lighting Restoration by Olek Lejbzon. 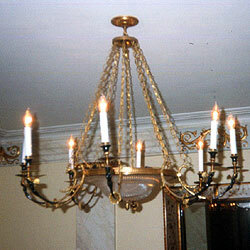 Monumental Sconce Restoration for 1st East Avenue, NY,NY. 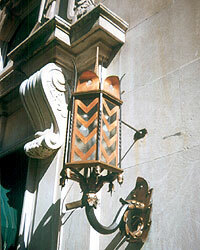 Exterior sconce was painted black, actually had iron, copper & brass lighting restoration construction, "hidden to prevent theft". 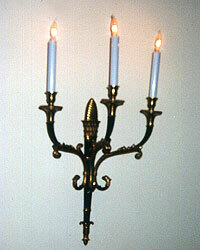 Cast missing elements, refinished, rewired & installed. 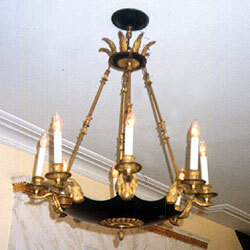 Restored Empire Lightings, Chandeliers and Sconces, black lacquer & (gilt) ormolu, rewired, reinstalled. 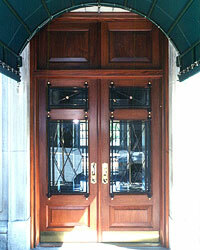 Produced shop drawings & fabricated new solid Honduran Mahogany raised panel doors, transom, & casing, custom profiles and moldings and restoration.